Head to the bull ring (and we don’t mean a day shopping in Birmingham) in Pamplona, a 5 reel, 1,024 ways to win video slot powered by IGT. Based on the world famous bull run, it comes with wild wins that are doubled and a bonus feature that offers up to 90 free spins with multipliers of between 3x and 20x. Play from between 50p and £1,000 per spin. Set against the backdrop of a bull ring, the reels have a strong feel of southern Spain. Joining the A to 9 playing cards are fans, flowers and a matador’s red cape – the bull is the top paying symbol, offering 500 coins if you manage to land 5 on a payline. The matador is the game’s wild – it can land on reels 2, 3, 4 and 5 only and substitutes for all other symbols apart from the scatter (the bull in profile). Whenever the matador forms part of a winning combination, that payout is doubled. Before the free spins play out, the multiplier value is assigned. This starts at 1x but can be anything up to the maximum multiplier amount from your chosen combination. More free spins are on offer if you land 3 or more bonus scatters during the feature. You select the exact combination you want after the current block of spins has played out. You can re-trigger the free spins up to 3 times giving you up to 90 free spins with a 3x multiplier or 15 free spins with a 20x multiplier for example. 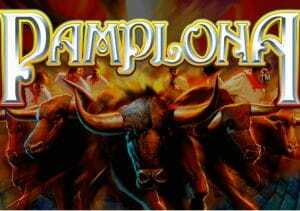 There’s plenty of action on offer in Pamplona – the 1,024 ways to win game engine keeps things ticking over in the base game but the best winning opportunities come via the free spins where the multiplier can have a big impact. We found the variance to be on the high side so some careful bankroll consideration is recommended. The bullfighting theme will no doubt put some people off. If you don’t mind the controversial subject matter, the feature makes Pamplona worth a virtual visit. I also recommend you try some other Spanish themed video slots such as Playtech’s The Riches of Don Quixote.